The Middlesex County Republican Women’s Club is an organization of like-minded individuals who are committed to good government. We believe that the best government is smaller government that is close to the people and responsive to the people’s needs. While our membership is comprised mainly of women, we support both male and female Republican candidates for elected offices on a local, state and national level. Men who adhere to Republican values may become associate members of our club. The Middlesex County Republican Women’s Club (“MCRWC”) was established in February of 2009. Our women members automatically become members of the National Federation of Republican Women and the New Jersey Federation of Republican Women. We impact Middlesex County by helping to elect as our government officials women and men who share our Republican values. We sponsor political workshops that equip Republican candidates to run for and secure elected political offices. We have assisted in the election of Republicans to all levels of government here in Middlesex County as well as at the state and national level. We encourage, support and provide opportunities for each of our members to be politically active. The opportunities are numerous and varied and include but are not limited to becoming a convention delegate, volunteering for phone banks, stuffing envelopes for candidates, and hosting fundraisers for Republican candidates. Download and print a copy of our bylaws here. 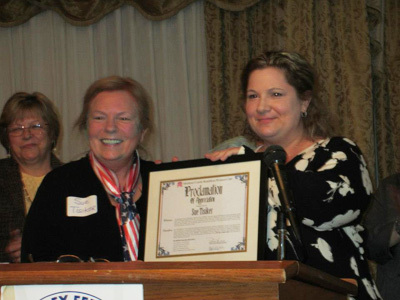 Sue Tisiker, President of the MCRWC, was named 2013 “Woman of the Year” by the NJ Federation of Republican Women. The MCRWC presented Sue with a special proclamation at the ceremony on April 27, 2013. Pictured above, Sue Tisiker (center), Tonia Kulberda (right) and East Brunswick Councilwoman Camille Clark (left). Photo courtesy of Rhoda Chodosh.